One lazy Sunday I found myself at Paul's Patisserie after much procrastinating. I visited the SE1 branch of Paul's patisserie where I received good service, which is worth a mention because great service always makes for a more enjoyable experience. The shop was nice and clean, with indoor and outdoor seating. The Paul's Patisserie bakery looks old school. As if pulled from 1889. The year in which it was originally founded. There were some brownie samples on the counter at Paul's patisserie, which my son liked the taste of, however he's quite easy to please! 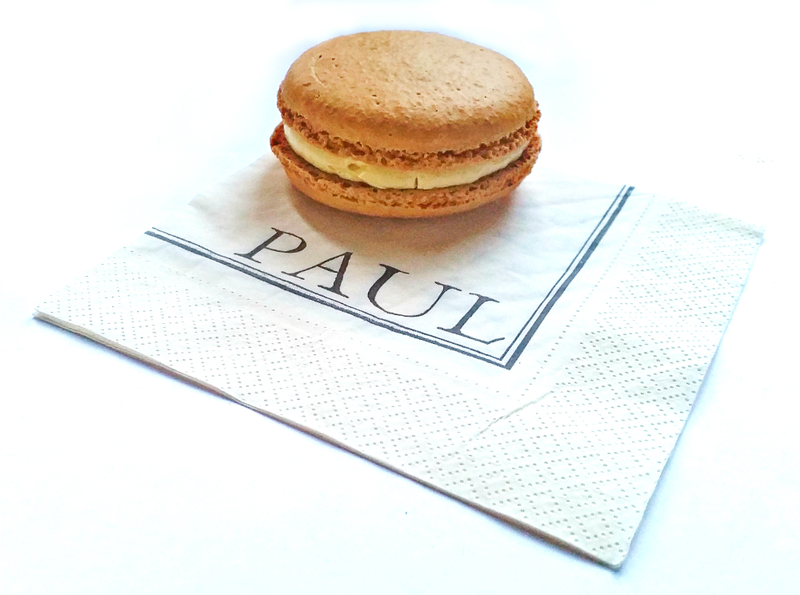 I didn't expect to be wowed by the giant macaron from Paul's patisserie, but thankfully it exceeded my expectations! The macaron is wonderfully chewy and filled with the softest, butteriest vanilla cream. It is neither too sweet nor too savoury and surprisingly quite filling! I like it so much I would definitely buy one again. Macrons are the perfect afternoon tea companion. The Paul's patisserie eclair was pleasant but not very memorable. Paul's coffee cream eclair has the traditional hard icing on top, with the perfect hint of coffee. The filling is a bit jelly like, and it's hard to work out whether or not it's supposed to be a chocolate filling as it's quite bland to the taste. Found this review of Paul's patisserie Bankside useful? The photos of food in this blog post are originals, which were taken at Paul Bankside London. Along with any text and personal opinions about Paul's patisserie and menu are copywritten by the owner of www.bestafternoonteainlondon.co.uk The photographs and text on this blog must not be copied. Distributed. Sold or printed without prior written consent of this travel and lifestyle blog owner. contact the site owner for more details.